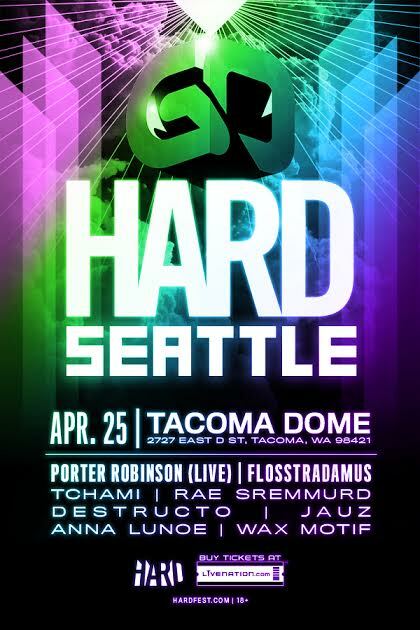 EmeraldCityEDM | HARD presents: goHARD Seattle with Porter Robinson, Flosstradamus, Destructo & more! HARD Events announces the goHARD Festival tour happening this spring at the Tacoma Dome on Saturday, April 25th 2015! Tickets are ON SALE NOW (be sure to select the lowest priced tier, Ticketmaster has been sneaky with the pricing). Hard Events, the promoters behind such major electronic music events as HARD Day of the Dead, HARD Summer and HOLY SHIP!, have announced today, February 26 the newest addition to their live experience collection with goHARD. HARD is well known for curating the most talented and influential artists in electronic music. goHARD is all about future music rotating with a different line-up for every date, each one highlighting some of the biggest acts in the genre alongside emerging artists.